I am just in love with Olivia Palermo's polka dotted cropped trousers. They look just so amazing and the way she has paired them with this asymmetric top... I can't close my mouth. 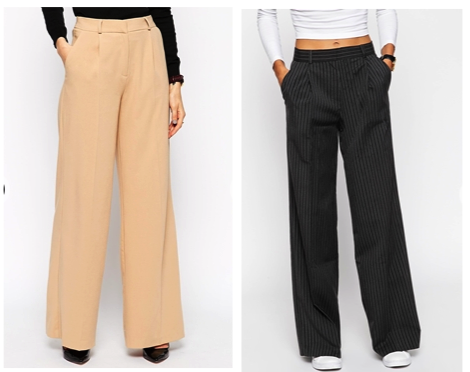 The WIDE TROUSERS are all over the new SS15 COLLECTIONS. I have been making a list of things that I will need for the new season to refresh my closet, so I was browsing around different online shops. I found a number of great pairs of trousers that I would love to be a part of my new look during the next season :) Here is just a small selection of some of my favourites. What do you think? Do you own a pair already or are you about to purchase one? Yes, she is definitely a true inspiration. So beautiful and interesting post! Like your blog and the way you write! Thank you so much D. I love your blog too:) Thank you for reading. I love all your picks, and I want them all! I love wide pants! They are so comfy but sooo pretty! It portrays such aura of confidence...Nice!